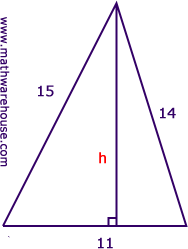 Object of this page To practice applying the conventional area of a triangle formula to find the height, given the triangle's area and a base. In this triangle, the area is 17.7 square units, and its base is 4. Let's find the height of this triangle, which is pictured below. The red measurements are the ones that are relevant to this problem. Remember that each triangle has 3 base/height pairs. So whenever you are talking about the height, we have to make sure we know which of the 3 'bases' (or sides) of the the triangle we are talking about. We can tell from the picture, that the height is perpendicular to the base whose measure is 4. That is why the side of length 4 is the base and the other sides do not affect this problem. If the area of the triangle on the left is 658.8square feet and its base is 24 inches, what is the height? 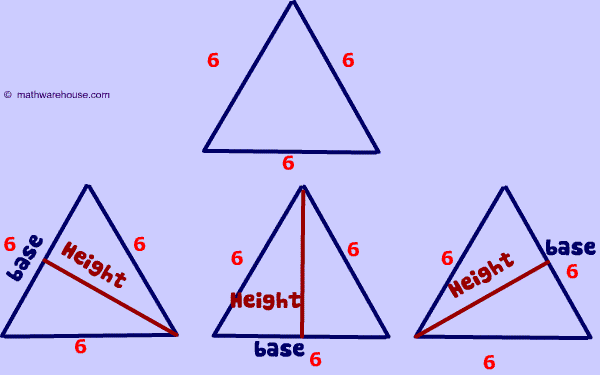 If the Area of the triangle on the left is 11.6 square units and its base is 4, what is its height? 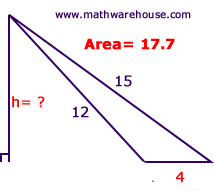 If the Area of the triangle on the left is 17.7 square units and its base is 15, what is its height? 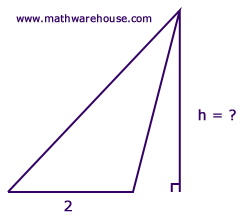 If the Area of the triangle on the left is 35.8. square units,find its height. This problem is very similar to example 1 . In every triangle, there is 3 base/height pairs , but you can tell from the picture that the base is the side of length 12. Remember that the base and height are perpendicular. 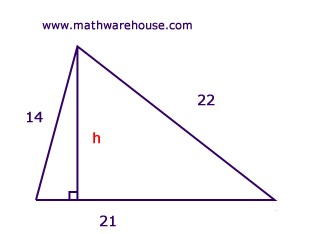 If the Area of the triangle on the left is 73.5. square units, find the height. This problem is very similar to example 1 . In every triangle, there is 3 base/height pairs , but you can tell from the picture that the base is the side of length 11.Remember that the base and height are perpendicular. If the Area of the triangle on the left is 141.9. square units, find its height. This problem is very similar to example 1 . In every triangle, there is 3 base/height pairs , but you can tell from the picture that the base is the side of length 21. Remember that the base and height are perpendicular. All right, now let's try some more challenging problems involving finding the height of a triangle. You should be comfortable with the properties of equilateral and isosceles triangle types before attempting the following questions. If the perimeter of an equilateral triangle is 18 and its area is 15.6 square units, what is the measure of its height? Also, does it matter which side you choose as your base?